The next retreat is the NOMC 2019 Fall Retreat, October 18-20, 2019, at King’s Arrow Ranch. Look for a flyer in your e-mail about two months beforehand. Our retreats are held twice per year, in the Spring and Fall, at King’s Arrow Ranch in Hillsdale, MS.
Click on this link to go to our Contact Us page. The NOMC 2019 Spring Retreat is now history. 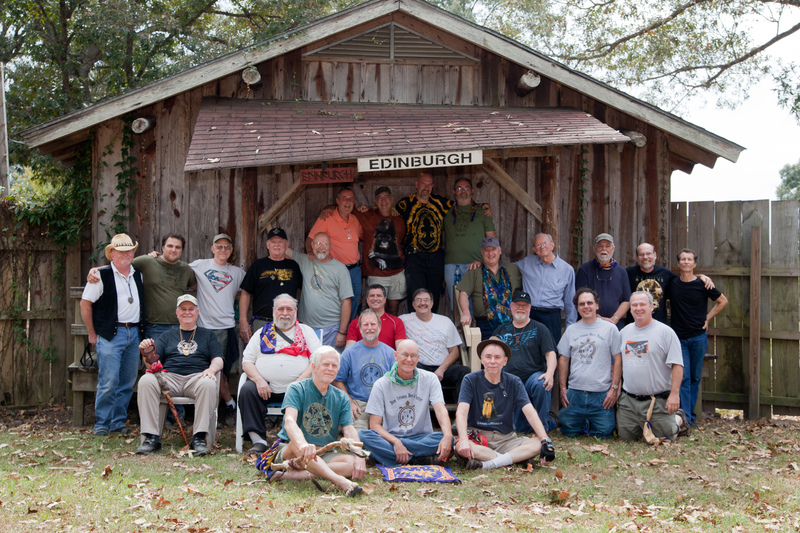 Seventeen men attended, including one man attending NOMC for the first time, one for the second time, and one who had not attended in six years. The man attending for the second time had a broken toe and a bandaged foot, but he really wanted to come, and another man drove him there and back. The weather was excellent, especially considering the forecast included a fair amount of rain. We had enough rain Saturday night to leave a dew-like dampness on the ground on Saturday morning, but nothing other than that. Temperature favored shorts. The theme was “The Alchemy of Ordeal and Blessing”. We had three stories, each told by a different man. The last one, the Prodigal Son, while familiar to all, brought out profound new insights through the sharings of men. Click here to see the flyer that went out in advance, and for the group photo click here. At the end of the retreat, we were graced with a visit from one of our long-time members who has been unable to attend due to illness. Click here for a photo of Mickey being greeted by Francis. The NOMC 2018 Fall Retreat is now history. Fourteen men attended, including two men attending NOMC for the first time. The weather was pretty good, a little warm on Friday afternoon/evening, and just a little rain Friday overnight, and some at the end of the Saturday night activities, but the colder weather that came with it was welcome. As part of the cabin ritual, each man selected a stone, which he could carry around during the retreat and decorate (including etching into the stone) on Saturday afternoon. Also, the cabin ritual included a mythopoetic experience. The theme was “Lasting Through It. Carrying the Weight. Letting It Go”. Click here to see the flyer that went out in advance, and for the group photo click here. The NOMC 2018 Spring Retreat is now history. Nineteen men attended, including two men attending NOMC for the first time. The weather was dicey, but most of the rain was at night. Because of the cold and threat of rain, the Saturday night activitieswere held in the big circle cabin, not around the fire. The theme was “Rediscovering the Sacred Feminine”. It turned out to be an exploration of the archetype of the feminine goddess as well as the feminine (yin) in every man. Click here to see the flyer that went out in adavance, and for the group photo click here (thanks to David Davis). The NOMC 2017 Fall Retreat is now history. Nineteen men attended, including three new men. The weather was good enough, except some rain, especially Sunday morning. Saturday afternoon activities once again included a menu of options, including I-group work, breath work, and tai chi instruction. The theme was “Magician Energy”. Click here to see the flyer that went out in advance, and for the group photo click here. (Thanks to David Davis). The NOMC 2017 Spring Retreat is now history. Twenty men attended, including one new man, and George Montero and his son joined us briefly after lunch on Sunday. The weather was perfect (again!) – low 50’s to mid-70’s and no rain. Once again, the fire felt good in the morning and evening, and shorts felt good in mid-afternoon. The usual shadow dance activity for Saturday night wound up being supplanted by a lively discussion of men’s fear of the dark and what may lie hidden there. The theme was “The Unwanted Child”. Click here to see the flyer that went out in advance, and for the group photo click here. (Dan apologizes for the smudge on part of his smartphone’s lens. Thanks to Richard Vallon for photoshopping the two photos together). The NOMC 2016 Spring Retreat is now history. Fourteen men attended, including one new man. We had expected a few more, but illness or exigencies came up. The weather was perfect – low 50’s to mid-70’s and no rain. The fire felt good in the morning and evening, and shorts felt good in mid-afternoon. Our usual work in the large and small circles was fruitful, and Saturday afternoon and evening activities included I-group work, breath work, and tai chi as options along with an arts and crafts activity. Saturday evening around the fire included two rounds of an imaginative story, with each man contributing a piece: something about building a submarine in the desert with silk from the Andalusian blue-faced spitting spider! The theme was “The Garden in the Castle”. Click here to see the flyer that went out in advance, and for the group photo click here. The NOMC 2015 Fall Retreat is now history. Twenty-four men attended, including one new man, along with one who only attended once before, and a few who had not attended in many years. Although Hurricane Patricia threatened bad weather from the moisture it sent toward us, we had good weather until Sunday morning, and that was only a drizzle, and we finished up before noon around the fire pit without getting wet. The worst rain hit later Sunday afternoon as we were driving home. The two poster boards with pictures of previous attendees marked the 25th anniversary, as well as the memorial ceremony/reminiscence on Saturday night which allowed us to truly honor thirteen members who had passed from this life. The theme of The Deeper Story had meaning for many men. The mythical story was a version of the 12th century Cretien de Troyes’ Perceval, with the wounded Fisher King and the Grail Question that the novice knight failed to answer when first given the opportunity, and with the two women who made him realize the wrongs inflicted in his earlier callow youth. and for the group photo click here. and for a page of pictures inspired by the theme of Elder Energy, click here. The Fall 2014 NOMC Retreat is history. Twenty-three men attended. The weather was great (a little cold at night, but that made the fire that much more welcome) and some good soul work was done. The Spring 2014 NOMC Retreat is history. Twelve men attended. The weather was great and some good work was done. The Fall 2013 NOMC Retreat is history. Fifteen men attended, including one new man. It was a smaller than usual group that experienced a very powerful weekend. To top it off, our longtime elder George Montero came up to King’s Arrow Ranch on Sunday after lunch. George is no longer physically able to attend retreats but as a birthday gift he asked his son Chris to drive him. Everyone really enjoyed seeing him again and taking pictures and visiting with him and his son. The 2013 Spring Retreat is history. 22 men attended, including 2 father-son pairs. The weather was beautiful, and the theme was “Shifting Energy”. The 2012 Fall Retreat is history. 23 men attended, including 1 new man. The weather was beautiful, and the theme, Senex and Puer, really touched many men. The 2012 Spring Retreat is history. 18 men attended, including 3 new men. The weather was beautiful, even though it stormed Saturday afternoon and evening all around the area without hitting us. The 2011 Fall Retreat is history. 22 men attended. The theme was “Blessings”. To see the pre-retreat flyer click here and for the group photo click here. The NOMC 2011 Spring Retreat is history. We missed George Montero, our elder, whose eyesight no longer allows him to attend. We also honored our recently passed brother, Ron Naas. To see the pre-retreat flyer click here, and for the group photo click here. The NOMC 2010 Fall Retreat is history. It was the 20th Anniversary Retreat. 27 men attended (2 left before the picture). The weather was perfect. For a look at the pre-retreat flyer on the theme “Celebrate” click here, and for a photo of the group click here. The NOMC 2010 Spring Retreat is history. 31 men attended. 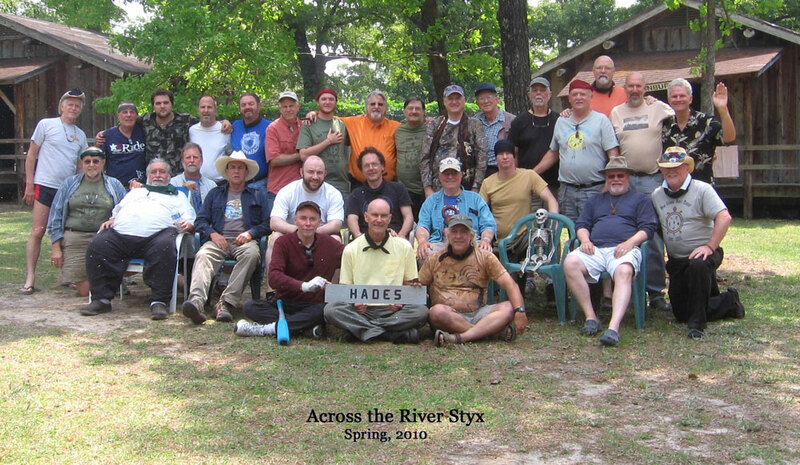 For a look at the pre-retreat flyer on the theme “Across the River Styx” click here, and for a photo of the group click here. The NOMC 2009 Fall Retreat is history. 29 men attended. Click here for a photo of the group. Click here for a look at the pre-retreat flyer. Our work included large group and small group sessions, plus personal time to be alone, and a sacred space around the campfire for enactments of soul work. The NOMC 2009 Spring Retreat is history. 27 men attended. Click here for a photo of the group. Click here for a look at the pre-retreat flyer on the theme, “Heart’s Delight”. The theme of this retreat was Betrayal/Forgiveness. Click here for a look back at the pre-retreat flyer. The NOMC 2008 SPRING RETREAT is now history. It was a great retreat, with 31 men attending and 31+ ‘shadows’. Click here for a Group Photo. Many thanks to all who attended and to the facilitators: Ed, Mickey, Rick, and Ron. Click here to see the pre-retreat flyer. Many thanks to the facilitators and all the men who attended who made it such a great retreat. including 2 new men and a number of men who had not been with us since before Katrina. For a look at the preview click here. We shared our losses, we shared our pain, we shared our love for our beloved city, New Orleans….that was! It was facilitated by Jim O’Neill, Francis Coolidge, and Steve Lindsley. DECEMBER 2-4, 2005 KING’S ARROW RANCH. IN CELEBRATION OF NOMC’S 15TH ANNIVERSARY. 20 Men gathered at our badly damaged, sacred space, corral compound to spend the weekend repairing the cabins and putting the fence back in an upright position. The men worked cutting trees, repairing roofs, fixing gates and doing a general cleaning of the grounds. We opened the retreat Friday evening with our circle of men around the fire in the middle of the NOMC compound. We then had time after dark to meet in a circle and share Hurricane Experiences. The daylight hours on Saturday were spent working, what a beautiful sight watching the men work in harmony and acomplishing the mission. Saturday evening we had a brief circle for sharing and storytelling, however, most energy was spent working, HARD, and we retired about 9:30 p.m. Sunday morning back to work! We then brought our weekend to a circle closing ritual after lunch. Out of Chaos came a new beginning!!!!!! Here is the group (photo) of men who gave their time and effort, they came from Houston, Dallas, San Antonio, TX, Madison, WI., Jackson & Starksville, MS. Nashville, TN, Navarre, FL. Lafayette, Baton Rouge, Bush, Slidell, Covington, Hammond, LA and almost everywhere, even a couple from New Orleans……Winfred, Harold & many Grandfathers from the hereafter also blessed us with their energy and spirit. 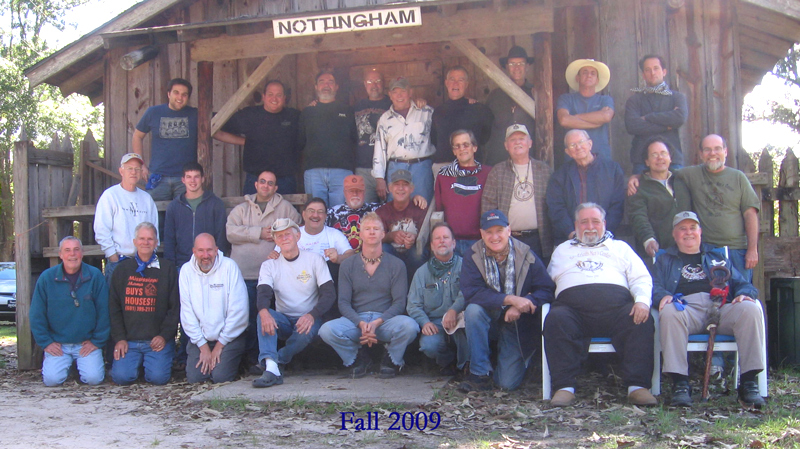 2005 Spring Retreat is now history, attended by 29 men, including 4 new men. We had beautiful weather and lots of small group work.